Last October at our State Grange session the delegates passed a resolution to seek the introduction of a bill into the General Assembly to investigate and implement new methods of recycling so that all plastics and paper could be recycled rather than going into our landfills. In previous years the delegates also passed resolutions to require deposits on all types of beverage containers rather than allowing them to go into the waste stream. A bill was filed to ban the use of plastic bags, but after a public hearing it is obvious there is enough divided opinion that the bill will probably not pass this year. Hopefully the General Assembly will pass a bill to study the issue so that an informed bill can be filed in the 2009 session. A bill to require deposits and recycling of beverage containers has made good progress this year. Senate Bill 357 would require deposits on all containers for carbonated beverages two liters or less in size and for noncarbonated beverages one and one-half liters or less. This would include all forms of water, including flavored water, but would not include juices. The bill does not specify whether or not milk containers would be included. One of the main objections to an expanded bottle bill comes from the smaller retail stores where handling many returned containers could pose a problem of space and sanitation. Senate Bill 375 would allow separate off site redemption centers and would allow small stores to refuse to accept empty bottles if there was a redemption center within one mile of the store. The budget will become a big issue as the General Assembly winds down its 2008 session. The economy is affecting State revenues almost as much as it is affecting individuals. As incomes drop, the amount the State collects in income tax also drops. As people purchase less gasoline in Connecticut, the amount the State receives in fuel taxes decreases. Meanwhile the State must pay more for just about everything it buys, just like everyone else. This is an election year, so legislators on both sides of the aisle do not want to raise taxes. Most towns will have to increase their local taxes to provide the same level of services, so no legislator wants to go on record as voting for any increase in state taxes. The General Assembly must adjourn its current session no later than May 7. As soon as the session adjourns the legislators will begin their campaigns for reelection. The Grange is strictly nonpartisan. We debate issues and lobby for legislation, but we do not endorse or debate candidates. 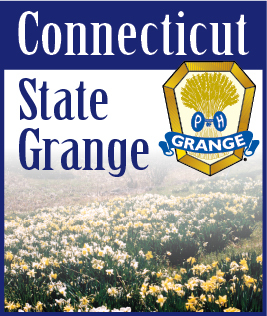 Over the summer candidates for office will be very willing to come to your Grange meeting and speak. It is fine to have a debate where the candidates from opposite sides debate the issues, but a Grange should avoid having only the candidate from one party and not the other. Members may wear political buttons at meetings, but they should refrain from speaking for or against any candidate while at the Grange.